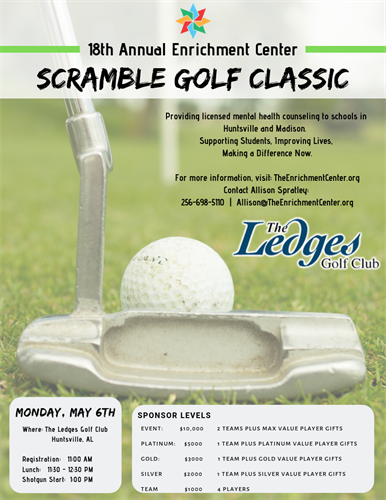 Join us at The Ledges Golf Club in Huntsville for our 18th Annual Scramble Golf Classic! This event raises funds and awareness for mental health counseling by supporting The Enrichment Center. The Enrichment Center is a local non-profit organization dedicated to providing free mental health counseling to local schools in order to provide professional counseling services to struggling students. Golf Team Sponsors welcome! Fee based on level of sponsorship. See attached flyer or visit our website for details.